Tom Ford has officially set the bar high for this season's New York Fashion Week. He kicked things off with a strong show that featured dozens of power pantsuits for both men and women, with just a handful of dresses near the finale. 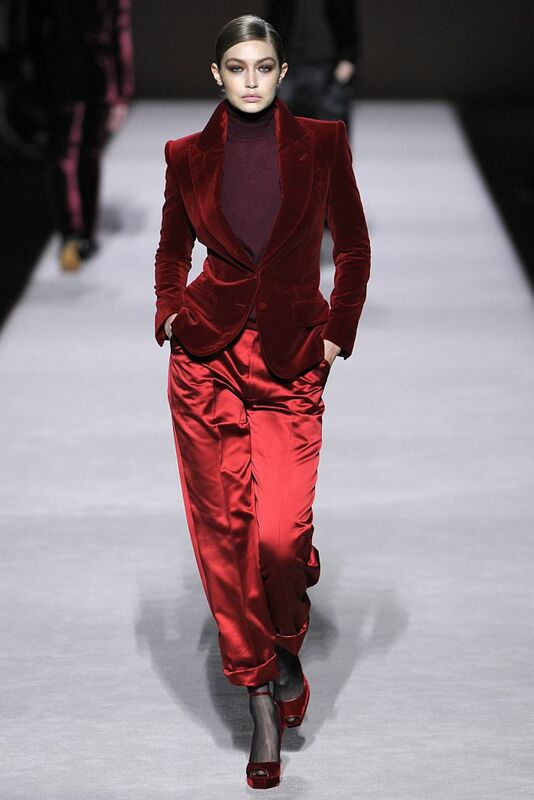 One of the suits, in particular, caught our eye: the red velvet and satin suit Gigi Hadid wore on the runway. As Fashionista editor Alyssa Vingan Klein pointed out, the suit is reminiscent of one from Tom Ford's Gucci era in the '90s—that none other than Gwyneth Paltrow wore to the 1996 MTV Video Music Awards. The 2019 version, however, plays with different shades of red and burgundy—an outfit trick that's approved by Kate Middleton—and mixes velvet with shiny satin. "While last season was decidedly feminine, this season is more about tailoring and a certain boyishness," Ford stated in a press release. "In terms of mood there is a languid sensuality and romance to this collection but also a certain peacock quality to the cut and colors of the pants, and the sharpness of the tailoring." Scroll down to see the suit in question as well as some other highlights from the show.